It’s summertime. So, of course, it’s the time of year when everyone rummages in the shed, finds their bike lying unloved and rusty where it was deposited after a wet ride last year, and decides to treat themselves to a new machine. It’s not surprising that bike shops do their best business during these warm sunny months. It’s also the time of year when I get most emails, texts and phone calls from friends looking for a few tips on what kind of bike should be their next purchase. I don’t mind helping friends with bike questions at all. In fact, I love it – there’s nothing quite like the simple pleasure of spending someone else’s money in a bike shop. But, in recognition of the fact I repeat the same advice to numerous people, I thought I should summarise the key points somewhere online. So here, carefully distilled, are some of the nuggets of wisdom I most frequently suggest. Some are the answers to questions that often appear in my inbox, on my phone or across a pub table, while others, frankly, are just well-intentioned rants I feel the need to pass on to any friend who will listen. Of course, not all my friends are bike beginners – many are far more knowledgeable than me. So bikers, feel free to criticise and add to what follows. And the rest of you, I hope this stuff comes in handy when you step into the bike shop. More than any other question I get asked, the most frequent is “What’s a good make?”. But it’s also the question that matters least. There are many good bikes out there, made by many companies. And to be honest, as long as you have a realistic budget, and you don’t go for inappropriate gimmicks, it’s very hard to buy a bad bike. Unless you go for the wrong size. So much more important than the brand you buy is the shop you buy from. Ask where friends bought their bikes. Shop around. Which bike retailer seems to be the most genuine? Who seems to ask the right questions about you and your riding? Who would you feel comfortable coming back to with a problem or a query? See if anyone is willing to throw in a few extras (helmet, lights, a lock, maybe) but don’t be greedy – a saving of £25 on accessories is arguably not as valuable as the reassurance of buying from a local shop you like and trust. The make may not matter, but the type of bike certainly does. Be realistic about your needs. Fast and speedy road bike? Versatile street/hybrid machine? Or rufty tufty mountain bike? If in doubt about what you’ll be doing, veer toward the off-road end of the spectrum. It’s easier to adapt a mountain bike later to make it speedier on the road than it is to convert a road bike for off-road duties. A few times, friends with a fair bit of money in their back pockets have asked for my opinions on new bikes costing under £150. For a new bike, £150 is really not much money to spend at all. In fact, the quality is likely to be so low that they would be put off cycling for life. If you’re looking to buy a bike on a budget, then consider the fact that at that level, an extra £50 or £100 can make a world of difference. Upwards of around £300, bikes start to become the kind of machine you can ride on a regular basis with some feeling of enjoyment. If this seems a lot, check out secondhand options. If you’re struggling to afford a decent new machine, then yes, there is always the secondhand market. For the price of a brand new pile of shiny creaking scaffolding poles, you can find a perfectly good pre-owned bike. The usual warnings apply as with anything bought secondhand, especially via the internet. If you find a bargain, be sure that the bike you’re buying is the right fit and size for you. The only way to be sure is to visit the seller for a test ride. The best bike in the world fails to be so if you can’t ride it comfortably. Ask about the history of the bike, and ask to see receipts. If you suspect a bike to be stolen, the honourable thing to do is to walk away. Bike thieves are a certain special kind of scum. Their customers are not much better. i) Goolie clearance – first check you can stand over the bike with room to spare. You’ll need a few inches for off-roading, If it’s too close for comfort, try a smaller size. ii) Seat height – Next, adjust the seat to the correct height (see 7). If you can’t get it high enough without exposing the ‘Min insert’ mark on the seatpost, try a larger size. ii) Reach – arguably the most important thing to check. When you’ve sorted the seat height and you’re sat on the bike in riding position, do you feel comfortable? Does your weight feel nicely balanced between your hands and your bum? If you feel too huddled, try a larger size. If you feel too stretched, try a smaller size. But bear in mind, if you’re checking out a sportier bike than you’re used to, a bit of stretch might be part of the bike’s design. Go for a test ride to settle in. Another rule for bike sizing: Ignore the nominal size classifications the manufacturers use. On one brand of bike, you may measure up as a 19”, as opposed to their alternatives of 17” or 21”. On another make, you may feel comfortable with an 18”. Some bikes have abandoned this way of sizing in favour of the S,M,L,XL system. Whatever bike you’re looking at, size up each different model from scratch, assuming that one marque’s idea of a ‘Large’ or a ‘17”’ is very different to another’s. It invariably is. Forget what you learned at school all those years ago about being able to touch the floor with both feet. If you use this as a guide to seat height, you’ll be nursing very sore thighs and bulging knees after a couple of miles. For most riding, the best seat position is one where, with the pedal at its lowest position and your heel on the pedal, you have the very tiniest amount of bend on your knee – virtually straight. If you feel more confident with the saddle an inch or two lower, especially off-road, then that’s fine, but you will lose some pedalling comfort. You should never ride with the seat too high – if you’re rocking your hips or you can feel your legs stretching to reach, lower your saddle immediately. Your handlebar height is rarely very adjustable. But that’s OK – it doesn’t need to be. If you’re feeling strange about the fact that you can’t lift your bars to a height that matches your saddle, then don’t be alarmed – it’s quite normal for your bars to be lower than your seat. A proportion of your weight should be borne by your hands – not just your saddle. Don’t think of handlebars merely as some kind of steering accessory. Don’t ever consider buying a bike without a test ride. Whether you’re going for new or secondhand, you can never tell if a bike is right just buy sitting astride it. Any decent shop (or reasonable secondhand seller) will accept some kind of security (credit card, cash sum or small child) as deposit while you go for a spin. When you test ride, try to pick a route with climbs, descents and corners that will give you a reasonable impression of the bike’s fit and comfort. If it ain’t comfy, don’t buy it. Suspension is fairly new on the scene. Just a few short years ago, it was seen as an expensive novelty. Don’t assume that just because your riding may take you over a few bumps, suspension is vital. Most decent mountain bikes costing anything over a couple of hundred quid will have front suspension. This is no bad thing, and helps to make the ride smoother and more comfortable. But unless you’re spending an amount approaching £1000, I would think twice before you opt for rear (or ‘full’) suspension. On sophisticated bikes, rear suspension is great. On cheaper models, it’s a heavy waste of money that detracts from the quality of the rest of the bike. It’s not compulsory to wear a helmet. Many people feel that helmets make cycling safer, but their benefits are far from proven. I choose to wear one for most of my cycling, but I’d recommend my friends to do whatever they feel is comfortable. If the idea of wearing a helmet is putting you off riding a bike, then fine – get a bike, ride helmet-less and enjoy yourself. If you’re uncertain about idea of the weight and expense of a helmet, consider that most helmets are now very light and can cost as little as £15 or £20. Try one. And if you do choose to wear one, take a few minutes to adjust the straps for a proper fit. There’s nothing quite as useless as a helmet perched on the back of your head with the straps swinging down like a hammock. Most bikes these days will have between 14 and 27 gears. But it’s not the quantity that counts – it’s how you use them. Don’t assume that the higher the gear, the faster you will go. Get used to spinning your legs in nice fast even circles – each revolution taking much less than a second. Then adjust the gears to suit your legs – not the other way round. If you’re pedalling with a discernable left-right-left-right feeling, or you can feel yourself rocking from side to side, you’re very likely to be in the wrong gear – change down and be kind to your knees! If your bike has gear shifters on both sides of the handlebars, and you find yourself confused, then go easy on yourself. Leave the left-hand shifter in ‘2’ and do all your changing with your right hand, with continuous pedalling that eases for a stroke or so after each shift – this gives the gears a chance to change. Pedal using the balls of your feet: the widest part. Try not to pedal with your heels or the centre of your feet. If you’re wearing high heels and you find that the pedals naturally seem to fit at the back of your foot, then don’t wear high heels. 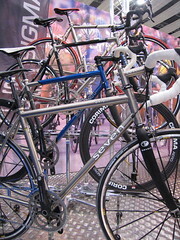 Historically, manufacturers who offer ‘women’s bikes’ have been supplying traditionally-shaped frames with dropped crossbars – handy for riding wearing a dress or long skirt. Like you do. Serious female cyclists would avoid these anachronisms in favour of a standard, or ‘gents’ model. But things have changed. Most of the major bike brands now offer women’s bikes that look at first glance like regular machines. The difference is in the detail. These bikes will typically be shorter, to accommodate smaller arms. They’ll often include other details like smaller brake levers, shorter cranks, women’s saddles and softer suspension. Check them out – they’re often worth a look. But don’t assume that a women’s model will necessarily fit you just because you’re female. Test ride standard bikes alongside these women’s versions and go with whichever feels most comfortable. Try not to be swayed by the pink flowery designs that often decorate these girlie bikes. 15. Disc brakes – Good or gimmicky? As with suspension, disc brakes are a feature which has made mountain biking more comfortable for many people. Discs are more powerful than other braking options, which means you’ll need less effort to achieve the same braking effect, so no more tired fingers after long descents. Other benefits include longer maintenance-free running time between services, an easier ride home following a wheel-wobble-inducing incident, and more life from your wheel rims, as discs don’t grind away at your wheels like conventional brakes do. But, just like suspension, all these benefits come at a price. Cheap bikes with disc brakes will often be sporting the worst examples of this technology, with more weight, poorer durability and worse performance than rim brakes on an equivalently priced bike. If you’re looking at a disc-equipped bike for less than around £500, check out the V-braked equivalents. You could be in for a surprise. So there we go. My 15 commandments. Can anyone think of anything I’ve missed? I can’t think of anything yet, but if something comes to me I’ll add it. And, if it’s OK with you, I may guide my customers to this page in order to save time! A very informative article. I realised several mistakes I made in the past when I was reading through it and I’ll definitely take the advice for choosing my next bike!! Are you saying women have ‘smaller arms’? Seriously though, thanks for this – very helpful you wizened wizard of wheelieing. It’s true, Will. True. Women, on average, have smaller arms*. I read this yesterday and then today I was cycling and realised that I don’t pedal with the balls of my feet. I normally have the pedal in the middle of my foot. I tried it your way but it felt weird, and a bit less secure – like my foot might slip off at any moment. Why is the advice to use the ball of your feet? What difference does it make? re the pedalling question. you get better leverage when pedalling wit the ball of the foot situated on the peddle. also if you were considering a road bike and wanted to have clips to keep feet on pedals these are geared towards pedalling with the ball of the foot as you pedal not just on the downstroke but also the upstroke. In effect you are pulling the pedal back up as well as pushing it down. it is ultra efficient mechanics to pedal with the ball of the foot and also results in a better leg extension. You answered that better than I am able. Hope it helps, ‘Me’. For any “normal” person who has gentle rides around town just to get from A to B, it’s probably not that important how you pedal. Though, arguably, you can “ankle” (pivot your foot at the ankle) to get some extra push – good for more speed or getting up hills. When you start riding for exercise, training, racing or touring, or when you enter the world of clipped pedals (toe clips on the pedals to insert normal shows into), or clipless pedals (special shoes and pedals which, contrary to their name, “clip” together”), then you probably want to start thinking about your pedal action more. This is not just important for efficiency, but you can actually injure yourself if your pedals and pedalling, aren’t set up right. If you feel uncomfortable pedalling with the balls of your feet, it may also be that your saddle is too low! Thanks! That clears that up. Now I don’t feel guilty for pedalling with the wrong part of my foot. I just cycle to work, so I’m not too worried about being hyper-efficient. Great advice and thanks for al your help! The last bike I owned, some 15 years ago, was a BMX. Gears? Gears? What are gears? Clive – massively helpful guide, thank you! Wish I had seen this before buying my bike! A very interesting and fun read. Has certainly given me some things to think about before getting back into the saddle.